Apple usually isn't all that subtle when it comes to putting down competitors, especially Google. But, Google tends to be a bit more passive aggressive with its jabs, and that shows again in the new announcement to developers talking about how to deep link to iOS apps from Google search results in the Safari browser.This means that a search result for a location will show as a deep link that bumps users directly to that place page within an app like Yelp. 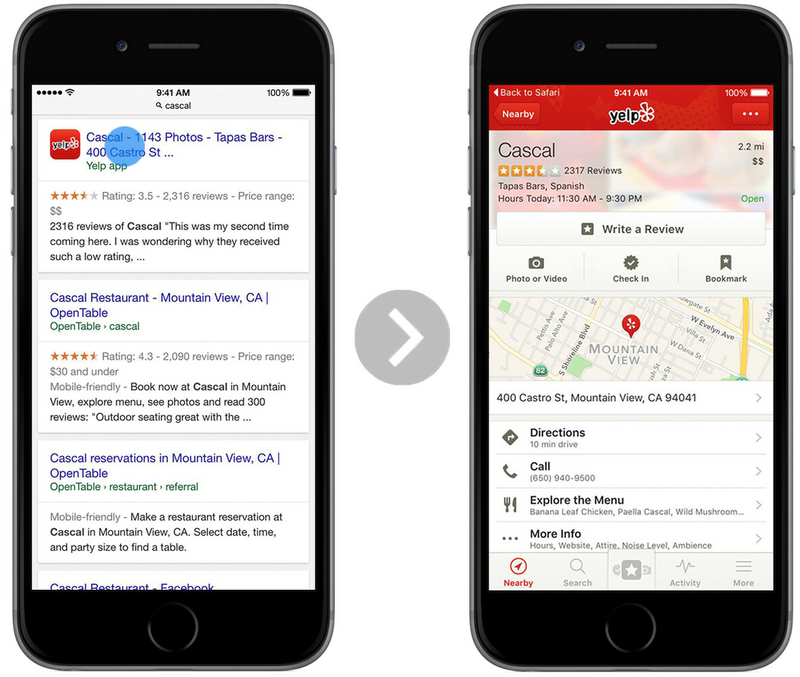 App Indexing is now compatible with HTTP deep link standards for iOS 9, as it has been on Android from the beginning ... And, of course, on Android, you can still get your content into the Search results page, autocompletions, and Now on Tap by adding HTTP deep links and integrating with the App Indexing API. Still this should be good news for developers and users alike, because it will make it easier to get out of the Safari browser and into apps, which tend to be faster and easier to use. Google said app content will start showing up in search results at the end of October. ¬_¬ No Google would never do anything shady. The cloak and dagger game that everyone plays. Overall, i still find Google to be more transparent than Apple. Funny how Google is contributing to everything for Apple and cant even f****** update their GARBAGE Android version of Hangouts while Apples Hangouts is flawless and leagues better. Cant even use hangouts because of how much of a sh*t show it is on my device. Thankfully I have it on my 6S+, and thankfully it runs flawlessly. Your own app isnt even tailored for your own OS, and leagues better on your competitors OS. Hah. Fixed. Congratulations on that tiny victory there. +1 Now how about everything else that Google has done right for everyone, including Apple? Aside from the lie that Hangouts doesn't get updated on Android, good job throwing out typical, non-specific critiques that sound bad but mean nothing. "Flawless, sh*t show, garbage, leagues better, tailored"....what exactly is the problem? Who knows? Who cares? It's better to just throw out random adjectives. That way, no one can call you on anything and you still get to write a troll comment. Bravo! People who have used (ateast tried to) the app on Android devices will know exactly what I'm talking about. Lie? Lol troll more and keep fishing for green thumbs. Put it this way, Hangouts update for iOS was more like a beta test before releasing it for Android. I have, runs perfectly, much better than the very limited iMessage ridden through with adware! I use Hangouts almost daily, so the bullsh!t you're spreading right now is ridiculous. Stop it. Troll elsewhere. Hangouts is all i ever use. It's perfect. Did you try connecting to the internet? Funny how Google just updated Hangouts on version 4.0 with more features than iOS version but keep ranting. Yes the update that came out on the 8th. Im aware. It took months and months of us Android users ranting while watching the privelaged boys over at Apple enjoy the Google service that works so well on iOS but garbage on Android. Nothing but blind fanboyism on this site, and trolls like yourself, Bobby, and many others. I watch you get cornered by counter comments while you have no educational value to add to your trolling. Might want to try out for the local chess club or bocce league to give your eyes and fingers a rest from visiting this site every day being nothing but another Patriot. Are you trying to kick knowledge by posting reddit links? If you take reddit for granted then every app out there has issues. Daily dose of redditors... Like I said just above your head you are Sauce troll with multiple accounts. Who is Sauce you ask? Here you go: Sauce OG:http://i.imgur.com/XVabQeg.png Sauce 2:http://www.phonearena.com/user/sauce2 Sauce 3:http://www.phonearena.com/user/Sauce3 Sauce 4:http://www.phonearena.com/user/Sauce4 Sauce 5:http://i.imgur.com/KoVpGGY.png Athene (also one of Sauce's account or just call it Sauce 6)http://www.phonearena.com/user/Athene Bonus: Athene was also a redditor and he used similar response just like you. I think I have enough proof to know who are you. Redditor proof:http://i.imgur.com/LL5z1aG.pnghttp://i.imgur.com/FBjmJF4.png (Mentioning reddit.com/r/iOSthemes and reddit.com/r/jailbreak) Here is you on r/iOSthemes:https://www.reddit.com/r/iOSthemes/comments/2nrnbn/looking_for_a_good_wallpaper_to_match_this_theme/ Here is you on r/jailbreak:https://www.reddit.com/r/jailbreak/comments/3j5208/question_is_this_a_bug_or_is_it_normal_for/ "Might want to try out for the local chess club or bocce league to give your eyes and fingers a rest from visiting this site every day" Same response here:http://i.imgur.com/pFByu9J.png From all of this we can realize that the real troll is you getting banned and making multi-accounts to just get banned again. After all this here everyone will just ROFLcopter at you. I guess you're ready to get this account banned as well. You must really have no life, creating multiple accounts on PA just to get them banned. Google getting desperate since Apple has allowed users to lock them out of Safari for advertising and Google's search deal with Apple is about to expire. Look for Google to be on the outside, looking in at its most profitable base, once the deal expires. DuckDuckGo can keep gaining share. Apple wouldn't do that. Without Googles products on the app store it would hurt apple. 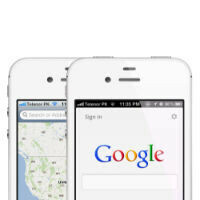 I would stop using an iPhone just for Google maps. What do you care if you're not using iOS? Throws shade? What is this WSHH?